Conservative activists and judges have pushed falsehoods about abortion for decades. It’s about to pay off. Photo illustration by Natalie Matthews-Ramo/Slate. Photos by Andrew Caballero-Reynolds/AFP/Getty Images, Chip Somodevilla/Getty Images, Alex Wong/Getty Images, Brendan Smialowski/AFP/Getty Images, Win McNamee/Getty Images, Pete Marovich/Getty Images, Mandel Ngan/AFP/Getty Images, and Mark Wilson/Getty Images. Conservative activists and judges have pushed falsehoods for decades to fight abortion. This Supreme Court will embrace them. But it’s also true that cases can be overturned without anyone ever saying so outright and that legal protections are only as robust as the ability to enforce them. There are currently at least 13 cases teed up to help the Supreme Court overturn Roe v. Wade without even having to say that this is what it’s doing. One of those, June Medical Services v. Gee, will be decided at the court this week. We can talk and talk and talk about the vital importance of precedent. But what happens in the silences between confirmation hearings matters far more. It’s what we aren’t listening for that could change everything. Since the day Roe v. Wade was decided in 1973, there has been a fierce and desperate national movement to reverse it. That doesn’t mean the majority of Americans feel this way—polls show that today, a record 71 percent of voters oppose overturning Roe. But what the public wants and what the Constitution requires don’t matter to anti-abortion activists—what matters to them is that every clinic that’s shuttered is a win. This isn’t a political movement so much as a zero-sum guerilla war, and that means that wins achieved in secret or by using subterfuge still count as victories. Anthony Kennedy was one of the deciding votes in Whole Woman’s Health v. Hellerstedt, the 2016 case that reaffirmed the right to terminate a pregnancy. 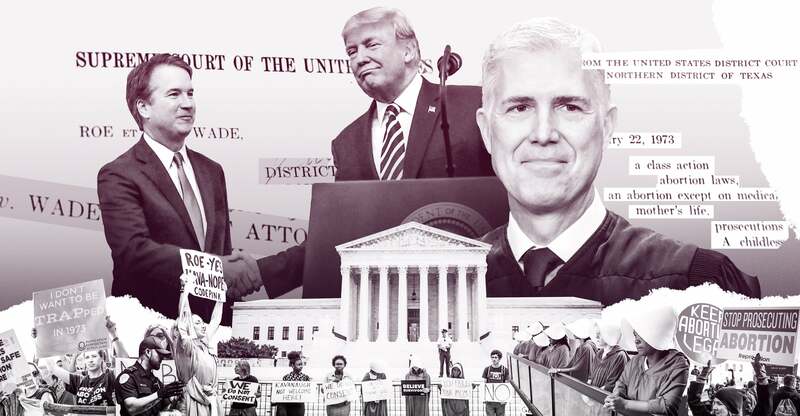 In the court’s 5–3 opinion (Antonin Scalia had died but had not yet been replaced) the majority held that legislative pretexts about maternal health and medical risk must be probed by reviewing courts and not just accepted on their face. The same day Kennedy stepped down, states that had pretended they were operating within the constitutional constraints of Roe, 1992’s Planned Parenthood v. Casey, and Whole Woman’s Health hastily passed laws with the singular purpose of forcing the court to reverse that doctrine. Lower court judges, similarly emboldened, started to simply nullify the core holding in these cases, behaving as though the precedent of Roe, Casey, and Whole Woman’s Health was already cobwebby artifact. Those judges aren’t just ignoring precedent. They are overturning it in the hopes that the Supreme Court will pick up the ball, run it into the end zone, and dance. Or, as is more likely, that a majority of the justices will get out the way so someone else can run the ball in for the score. This brings us to the case currently facing the court, June Medical Services v. Gee, which involves a 2014 law enacted in Louisiana requiring any abortion provider to get admitting privileges at a hospital that’s within 30 miles of the clinic where they work. It’s the exact same provision the court struck down as unconstitutional in Whole Woman’s Health, as Louisiana acknowledged in its pleadings, and so a federal district court blocked it as unconstitutional. But a three-judge panel on the 5th U.S. Circuit Court of Appeals determined in September, as Brett Kavanaugh was being vetted for the Supreme Court, that even though the two laws were functionally indistinguishable, the Louisiana law could go into effect because the facts in the Louisiana case “are remarkably different” than those in Texas. The full 5th Circuit, one of the most conservative appeals courts in the nation, voted not to reconsider that decision. That has led the plaintiffs, represented by the Center for Reproductive Rights, to ask the Supreme Court to grant an emergency stay, arguing that if the law went into effect, then only one qualified abortion provider would remain in the state. The real story here is how the appeals court managed to distinguish Louisiana’s law from the virtually identical rule in Texas, the one struck down only two years earlier. The panel did so by simply rejecting the trial court’s factual finding that at least one and perhaps two of the state’s three remaining clinics would have to close if the new law goes into effect, and that, if that happened, just two doctors at most could still perform abortions in Louisiana. The court found that whereas the Texas law at issue in Whole Women’s Health would’ve closed about 32 out of 40 of that state’s clinics, Louisiana’s law would only close a third. The appellate court juggled wait times and determined that fewer women would face fewer obstacles in Louisiana and that “the cessation of one doctor’s practice will affect, at most, only 30 percent of women, and even then not substantially.” Appeals courts, one should recall, are not meant to be triers of fact. We are watching the zeroing out of women’s interests alongside the zeroing out of women’s representation, all of it done via sly acts of omission. The state also gives us a pinky swear—offered up in its motion opposing emergency Supreme Court review—that the Louisiana law will not be enforced as the law had been in Texas. Instead, the state plans “an administrative process characterized by mutual communication among doctors, hospitals, and the state agency, with administrative remedies in the event of adverse licensing actions—not the abrupt descent into chaos Plaintiffs foresee.” This bit of administrative posturing may well be all it takes to give the justices the cover they need while still effectively negating Roe. A law built to close clinics will not close the same fraction of clinics in the same ways, so it must be constitutional. Judges say it won’t burden enough women enough to matter, and the state promises not to close clinics willy-nilly, so it must be constitutional. The holding in Whole Woman’s Health was unequivocal: A TRAP law will be struck down if it “provides few, if any, health benefits for women, poses a substantial obstacle to women seeking abortions, and constitutes an ‘undue burden’ on their constitutional right to do so.” Justice Stephen Breyer, writing for the majority, pointed to the “virtual absence of any health benefit” conferred by the Texas law. The Louisiana law confers no benefit either. The majority in Whole Woman’s Health was perfectly clear on this point: When there are no “medical benefits sufficient to justify the burdens upon access,” the law is unconstitutional. The 5th Circuit’s determination that the burdens on women aren’t crippling doesn’t change the fact that the law doesn’t protect any woman from any real thing. In the absence of a ruling from SCOTUS, the Louisiana law would have gone into effect Monday. Late Friday, Justice Samuel Alito, who handles appeals out of this circuit, issued a brief order barring the state from implementation until Thursday. This isn’t a signal of any conclusions on the merits. As Alito said, the justices—among them Trump’s nominees, Gorsuch and Kavanaugh—just need more time to consider the emergency appeal. TRAP laws are rooted in the willingness to go along with a fiction that something “protects maternal health” even when science and data show that it does not. Confirmation hearings are rooted in the fiction that a judicial nominee who pledges fealty to precedent cannot stand aside and allow a precedent to die. Women will be the victims of both such fictions. Perhaps we shouldn’t be surprised. It bears saying again that Donald Trump’s federal judicial nominees have been 76 percent male and 91 percent white. A review done by Bloomberg Law last week showed that female advocates made up only 17 of the 112 appearances before the Supreme Court so far this term. It’s a fitting bit of word salad that perfectly encapsulates the current moment. We are watching the zeroing out of women’s interests alongside the zeroing out of women’s representation, all of it done via sly acts of omission. Meanwhile, the Supreme Court is still deciding whether it wants to get involved. You can be certain that what John Roberts is currently grappling with comes down to this: whether the silent benefits of being done with Roe outweigh the costs of being overruled from below.